On our way back from my fathers office, we encountered this guy in his fancy RV. He was driving 63 mph in the passing lane on I-75 south. 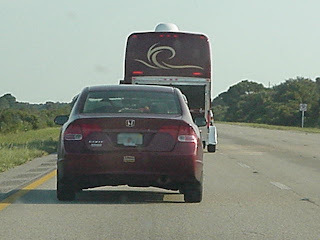 As you can see below people were trying to leave him enough room to move over, but no, he stayed in the passing lane. So it backed up traffic for miles. You can see people passing him on the right hand side, and flying him the bird as they passed. The speed limit for this area is 70, which we have learned that no one goes that slow, most go 75-80 mph. We were just as aggravated as the rest of the people on this road. Everyone on the right side was trying to get him to move to the right. As we passed him, we did like everyone else, we followed suite, we flew the bird at him. 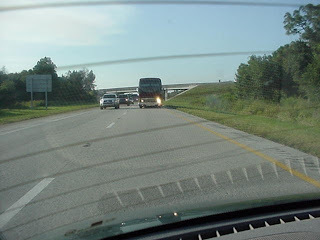 You can see in the picture above, the line of traffic that he has caused. If people are not watching what they are doing he is going to cause a wreck. Very frustrating. Left lane huggers make me crazy. Makes you wonder what the heck he was thinking or doing doesn't it? In Illinois it's against the law to drive in the left lane unless you are passing. People still do it and they are probably from other states! I flip 'em the bird, but plus I lay on my horn! one of my biggest pet peeves: driving slow in the left lanes. 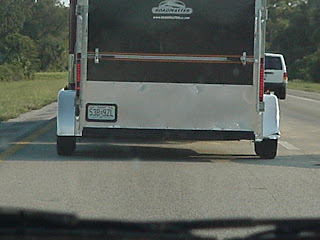 I think I followed this guy our entire vacation. I hate "cruisers". 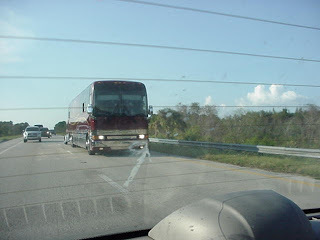 b) Jim always drives in the right lane so people can pass us, and pass us they DO! LOL! @ Michael, I agree it is frustrating!! @ Beth, Me too. That is why its called the passing lane. Some people are rude. @ Jeanette, It does make you wonder. @ John, I was told that it's against the law here too. @ Stephen, I agree with you.